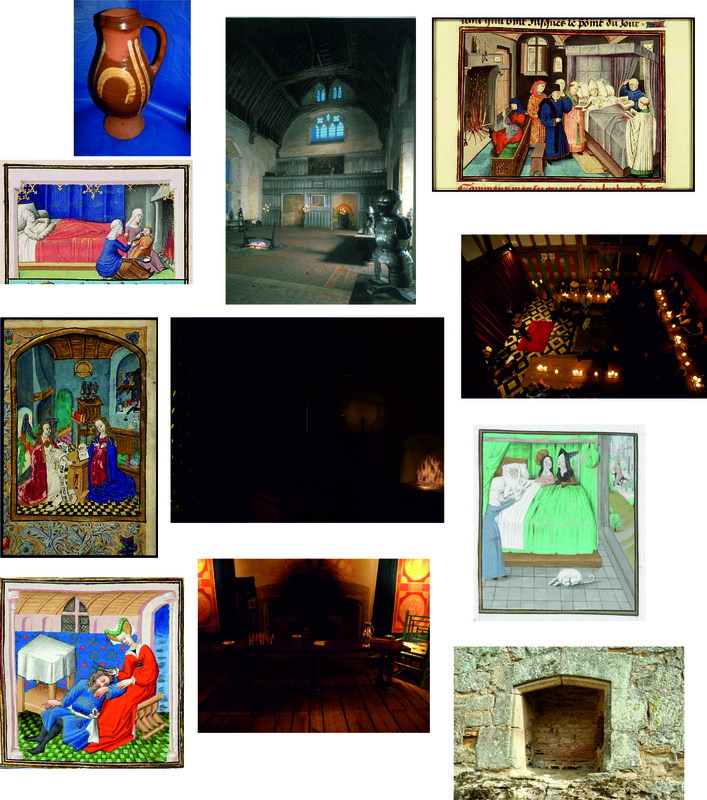 This post is going to discuss the first of a series of mood boards I created as a way of engaging with the 3d model of the private apartments at Bodiam as part of my PhD. The idea was that discussions (and critiques) surrounding archaeological visualisation have tried to engage with subjectivity and uncertainty in different ways. I suggest the presenting the representations of the past alongside some of the source images used to create them. 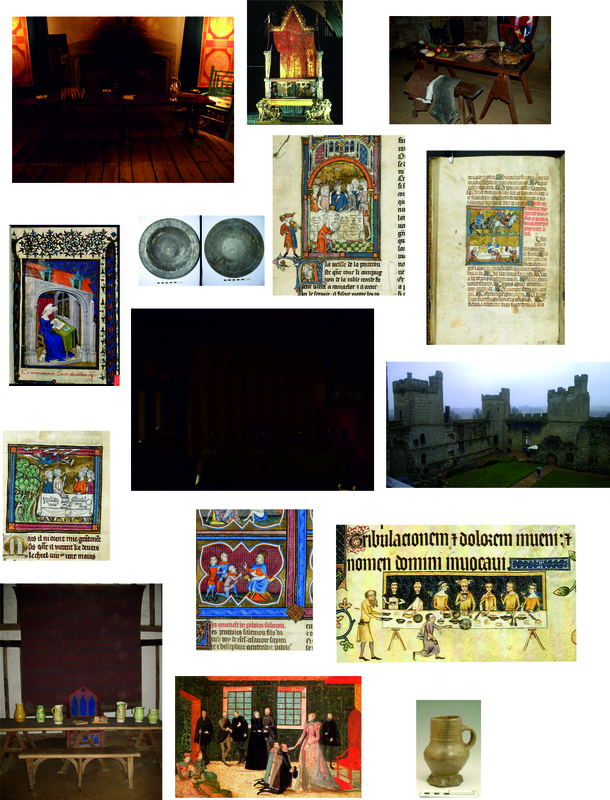 Each of the boards I have created is themed around some element of medieval life or experience. The board in this post relates to eating. Stock images from sites such as GettyImages tend to focus on people physically eating rather than things associated with that task. The Coronation Chair, Westminster Cathedral (BBCHistory 2014). British Library Royal 14 E iii, miniature of King Arthur’s Court. Following our adventures at Knole I was back in Southampton for the night before heading off to a workshop organised by Dr. Kate Giles and Dr Gill Chitty, University of York. I was invited to present a 20 minute paper on the broad topic of my work using “digital heritage to present and enhance understanding of, and visitor experience at, heritage sites”. This sounded like an exciting but terrifying prospect and I wasn’t sure which element I should go for, the wonderful Kate Giles helped to clarify by stating that the workshop was interested in focussing on the potential and limitations of working with external partners. So in the end I decided to give an overview of my experience of a Collaborative Doctoral Award working with Trust. 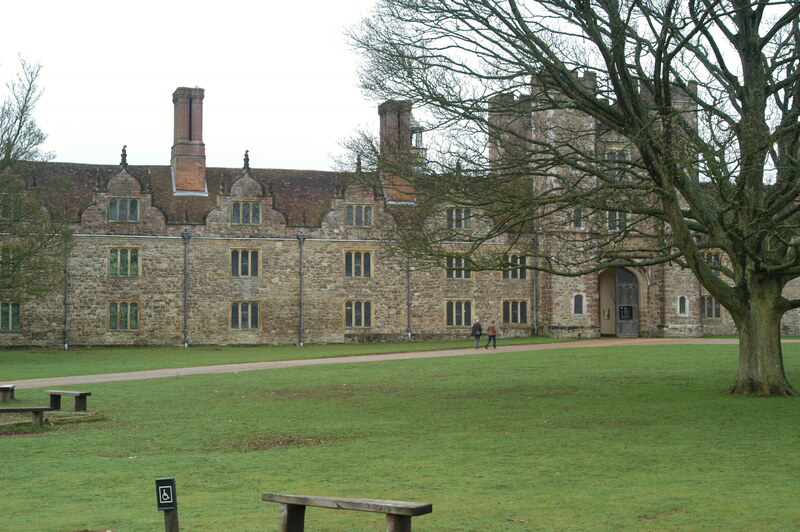 The workshop took place at the Weald and Downland Museum, which I have visited many times over the course of my thesis. 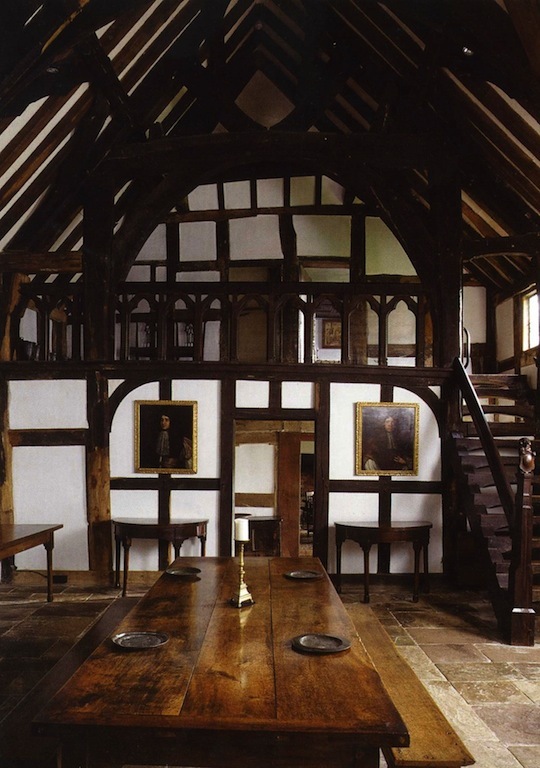 We were based in Crawley Hall, a beautiful a late 15th early 16th century first floor hall. Richard Harris gave a wonderful introduction to the building and the museum giving us a real insight to the workings of the Weald and Downland Open Air Museum and their wishes to further peoples understanding of rural life and landscape. The day was split into three broad sessions Issues and approaches, Techniques and applications and working with partners. Kate Giles started the day by introducing her work at the Guild Chapel in Stratford-upon-Avon, I really enjoyed her honest approach with her first encountering of digital visualisation technologies, the wish to highlight exactly how it would have looked according to one’s own research. This overtime develops into a wish to display different interpretations or presentations of the data, allowing viewers to engage with as much material as possible. This was followed by Daniel Mutibwa presenting on the Pararchive project. He gave us an insight to some amazing datasets that they are hoping to make available and a methodology for creating useful digital resources. Starting with an idea or something that is needed and then finding the right digital tool for the job. The second session on Techniques and Applications I found really engaging. I had met Sarah Duffy briefly on Jersey last summer, and was very interested to see her present on the use of multiple digital techniques and finding the best technique for each job as it comes. Her work on public engagement in Sudan was fascinating. Although I have worked closely with Gareth Beale on other things (Seeing, Thinking, Doing) and heard him discuss the British Memorial project it was wonderful hearing him discuss the overall aims and direction the project is going in. The same with Jude Jones and Nicole Beale on the use of RTI towards visual presentation. It was lovely to see a much more detailed paper on their project particularly following a mini project Jude and I are pursuing on a similar vane. The final session focussing on working with partners began with a presentation from Pat Gibbs from the Centre for Christianity & Culture at University of York. He presented some wonderful digital heritage applications. I found his ideals about creating something that aims to engage with a visitor before, during and after their visit, extending the interest and experience of the space. I was up next and I hope I highlighted how wonderfully rewarding working closely with a large organisation can be but also how frustrating it can be trying to find out who your research is for. This is something I wish to discuss more in the coming months. Finally Stuart Eve from LP Archaeology, gave a depressing but informing discussion on the issues of pursuing digital engagements when working on developer funded sites. 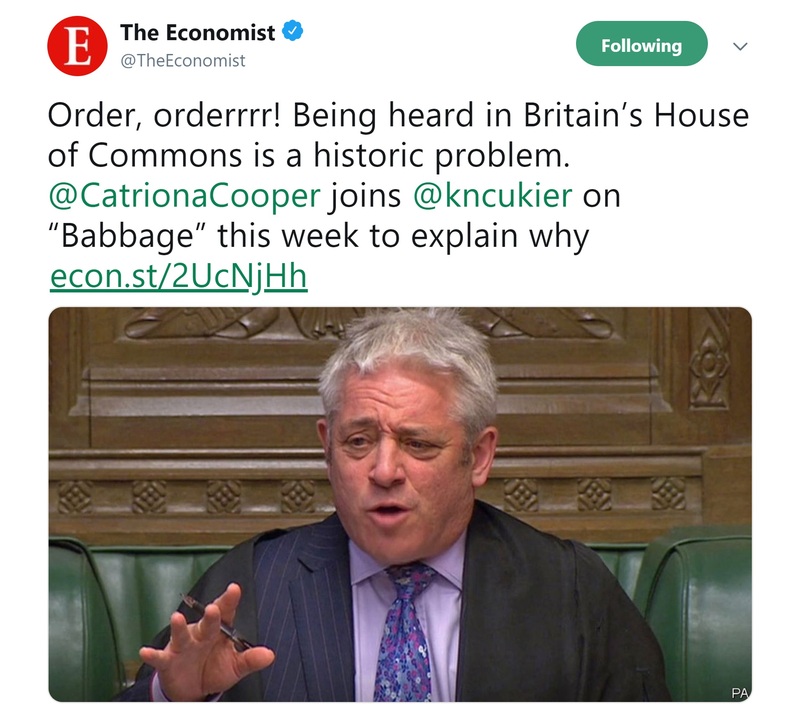 He put it in no uncertain terms and there simply isn’t enough money in the budget for commercial companies to produce digital output with legislation as it stands. For this to change there needs to be a change in the law forcing developers to encourage public engagement with the results of archaeological investigation which will allow companies to include this in their budget. I am definitely not informed enough on this area of engagement but Lorna Richardson has just finished her thesis on Digital Public Archaeology which Stuart suggests discusses this in detail, i’m looking forward to seeing her present at Digital Heritage 2014 next week. A number of these papers I have seen presented in various guises, or read papers in before. But being able to actually discuss the issues we all encounter was very engaging and lay the ground for lots of future projects. I feel the small number of participants allowed a really informed discussion on the wonderful opportunities for these techniques but also highlighted what limitations currently stand in the way of allowing them to develop. I hope the conversations continue. I’ve just about recovered from what has been a crazy but exciting week. I’ve been off all over the place doing bits and pieces; this is the first of three blog posts about it. The beginning of last week (25th June I think) myself and Sam Griffiths went over to Knole in Sevenoaks to run a mornings workshop on Digital Building Recording techniques. This was one of a series of workshops volunteers were attending over the week as part of the Knole Unwrapped volunteering project. We were slotted in between James Wright a Buildings Archaeologist from MOLA giving an introduction to traditional building survey and Matt Champion, of the Norfolk Medieval Graffiti Survey, on Graffiti. This meant we were perfectly placed. 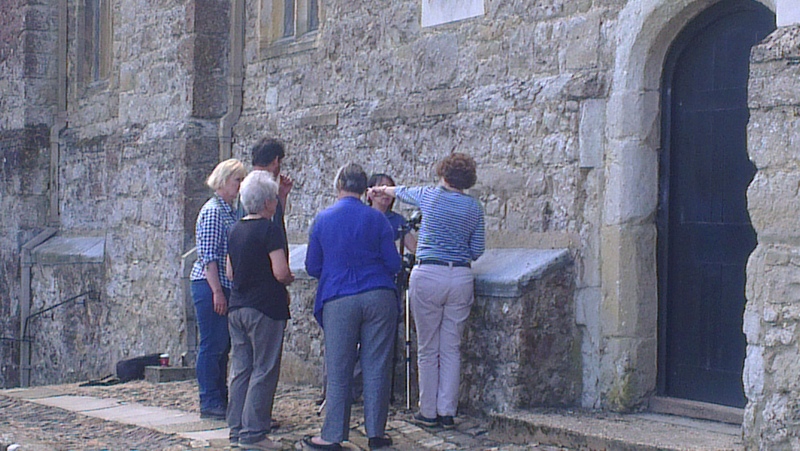 Our activities for the volunteers gave them a hands-on experience of using a Total Station to record an elevation and an RTI setup to record graffiti. Our day started with a short talk about the work that has been undertaken as part of the Elite Landscapes in South Eastern England Project and introduced the two techniques. 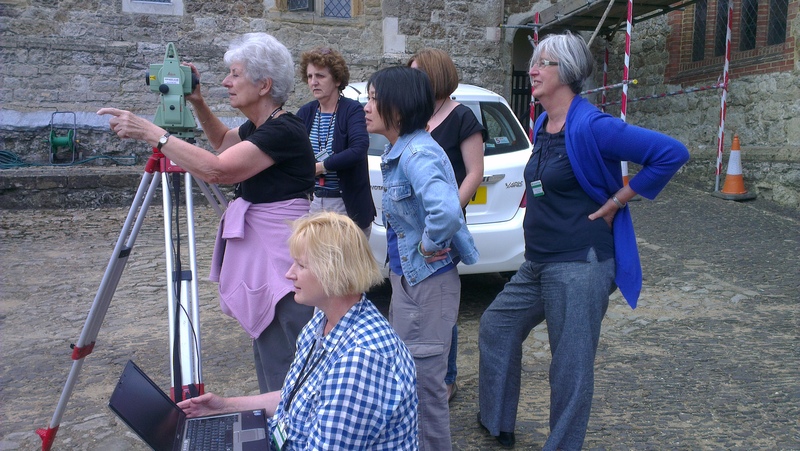 I introduced the team to the methodology Penny Copeland and I used at Bodiam Castle, this is a Total Station connected directly to a laptop during data capture running TheoLT which links to AutoCAD allowing the recording to be visualised in real time. The advantages of this setup means that you can correct mistakes as you go. It also means that you make decisions about what you are recording while you are on site. RTI stands for Reflectance Transformation Imaging. It is a recording technique which creates an image with interactive lighting. They are constructed from multiple images taken from the same position but under changing direction of illumination. The creation of RTI’s is very simple and requires little specialist equipment and the processing and viewing software is freely available online (Cultural Heritage Imaging). The process is very successful at highlighting changes in the surface’s shape and colour i.e. highlighting any present graffiti. It was then time to have a go! We went out the Stable Court where we divided the group into two, half working with me on the Total Station and the other half using RTI to record graffiti with Sam. Both groups seemed to really enjoy both activities. I found it really interesting engaging with them over the use of the techniques and how they might apply to other projects. James from Mola I think summed up the workshop by saying he felt how this was one of the best methods with engaging with groups. By introducing people with an interest to how we record, why we record and what we use it for it feels like we can get much closer to a collaborative engagement with the building. At the end of my last post I commented that “It feels strange working visually to produce something that is going to be used to model noise”. Equally I find the same is true when reading articles discussing acoustics in the past when they use graphs and plans to illustrate acoustical features. I am taking this blog to explore some of my thoughts on acoustics and how it is visually explored. This is by no means a polished exploration just some thoughts I have had. I know on some level I struggle to understand them as I’m not an engineer and don’t work so much with the mathematical modelling of acoustical spaces. However, I do wonder if this is more to do with the Ocularcentric approaches currently employed in archaeology to feel the need to make a graph to demonstrate our ideas. This quote from Devereux and Jahn (1996)“it is instinctively felt that sound is too immediate and ephemeral” highlights to me why we might feel the need to work in visual display. By discussing acoustics in terms of its visual display to some extent we are making our results more “scientific”. Having equally seen a hand clap described as “a single loud percussive noise” (Waller 1993) I feel we are trying to move beyond the more phenomenological areas of working in Archaeoacoustics. My other concern is that we are imparting our interpretations of the past with a modern mindset. Most of the spaces being discussed are monuments or sites from prehistory would they have been understood in the same visual depictions that we are using to demonstrate the spread of sound? Despite these thoughts I equally agree it is very hard to describe the results of this kind of work without graphs and plans to demonstrate clearly what we mean. As seen in my previous post I myself have to visually model a room to be able to acoustically model the space, this is how the technology has developed. A lot of the work done in Archaeoacoustics has been trying to line up Acoustical phenomena with visual stimuli. The most obvious example is the large body of work undertaken on Rock Art sites these include but are in no means limited to the Radio 4 documentary NOISE, (Reznikoff 2008; Waller 1993; Scarre & Lawson 2006). Rock painting is not the only application other papers also link “impressive visual backdrop[‘s]” (Watson & Keating 1999) to acoustical interesting spaces or examine spaces both a visual and acoustical way to compare the results (Wozencroft & Devereux n.d.). These are all fascinating and I am generally intrigued whether the locations were chosen due to acoustical phenomena already present in the natural environment or whether the construction of a site was intended to produce acoustical affects. Today acoustical engineering forms a subject in its own right. This does not mean we can entirely predict the acoustical properties of a building; we cannot model in the same way we can the aesthetics. Buildings are still constructed with errors in the acoustics. For example this lecture theatre has had to have the acoustics adjusted (the fabric boards, an absorbing material, cover holes in the wall designed to scatter sound). This leads me to believe that most acoustical properties related to monuments are accidental creations rather than created in the design. A modern example of this is the Whispering Gallery at St Paul’s cathedral (see Here for more details). Then potentially once discovered these properties are exploited or further explored in future constructions. I presume that considering even now with knowledge of how acoustics can be manipulated we don’t always get it right that the latter idea wasn’t true. Devereux, P. & Jahn, R.G., 1996. Preliminary investigations and cognitive considerations of the acoustical resonances of selected archaeological sites. Antiquity, 70, pp.665–6. Reznikoff, I., 2008. Sound resonance in prehistoric times: A study of Paleolithic painted caves and rocks. The Journal of the Acoustical Society of America, 123(5), pp.4137–4141. Scarre, C. & Lawson, 2006. Archaeoacoustics, Cambridge: Oxbow Books. Waller, S., 1993. Sound reflection as an explanation for the content and context of rock art. Rock Art Research, 10(2). Watson, A. & Keating, D., 1999. 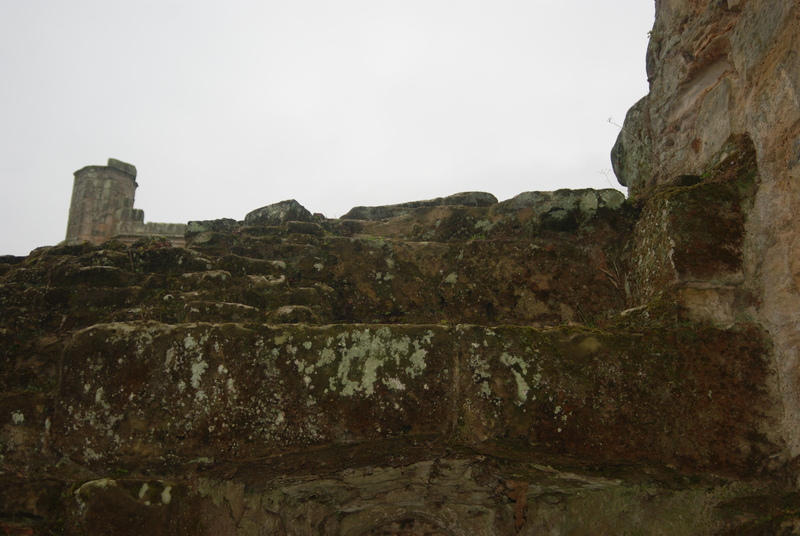 Architecture and sound: an acoustical analysis of megalithic monuments in prehistoric Britain. Antiquity, 73, pp.325–36. Wozencroft, J. & Devereux, P., Landscape-perception. Landscape & Perception project 2007-2012. Available at: http://www.landscape-perception.com/acoustic_mapping/ [Accessed July 11, 2013]. On the 19th March I attended the third workshop. The aim of the day was to explore how eyetracking technology can be exploited towards the understanding of visitor experience of 17th century painted cloths at Owlpen Manor in Gloucestershire. The day began with two groups of volunteers being “wired up” to the eyetracking hardware. The first thing to consider and why we can undertake this kind of experiment is that the eye does not work in the way we think it does. Eyes do not pan smoothly like in a film instead move in a series of small jerks. 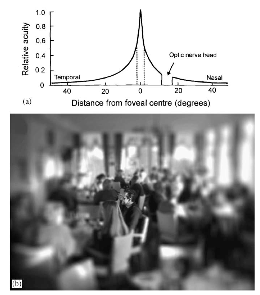 They actively only focus clearly on a very small area at the centre of the eye. The best way to think about it is that they essentially create lots of static images that focus on a small area. This means you are never too aware about exactly where you are looking and you can’t try and think too much about where your looking and don’t understand so the effect of wearing the headset is not to great. The first of these groups was a group of undergraduate and masters students while the second comprised of *experts* from the research network. The intention was to explore the effects of expertise on the way people are viewing the interiors of the room and the effect of knowledge. Each person was individually wired up to the equipment and given time to get use to wearing it. Then they were taken to the Great Chamber (Queen Margaret’s Room) here their responses to the room were recorded a number of times. The first observation was recorded to observe the difference between the two groups of volunteers. Each individual was then provided with more information about the room and the wall painting and sent back into the room with the intention to observe which areas were focussed on in more detail or not. Some preliminary results saw a huge difference in the way an expert was looking at the room as opposed to the student they were compared with. Students tended to move their gaze to try and take in everything whereas the expert took much more time paying close attention to the painted cloths. The day then turned to a series of talks by people involved with the project, firstly with an outline of the project to date. 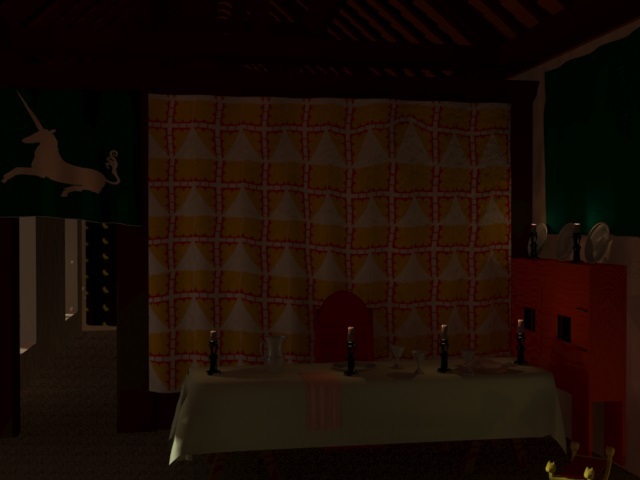 This was followed by a talk on Owlpen Manor and specifically the Painted Cloths displayed in the Queen Margaret room which we observed during the eyetracking experiment. The painted cloths are thought to be the only complete example of a decorative scene of interior decoration of this form the scene details the biblical story of Joseph. 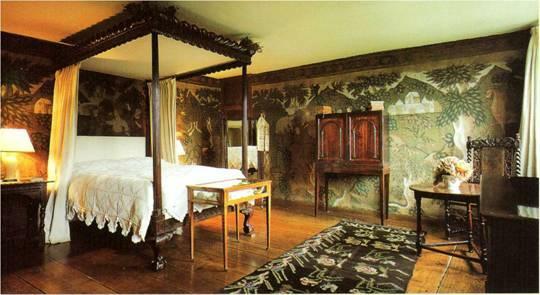 They were a cheaper substitute for tapestries before the introduction of wall papers and were produced by guilds until around 1502 and were considered out dated by the 17th century. Although no longer in situ they represent a complete scene and only are missing the bottom border when in the 1960s they were moved from a different bedroom during a cleaning at the same time. This move has been questioned as to whether the move would have affected the story at all? Whether areas of the border would have an effect or whether they are placed into a different order or were designed for the original space. The talk also touched on whether the effect of the cloth on walling affected the experience of the space if they had been painted with the same scenes with some discussion on the acoustical effects on the space. This led into a discussion of the direction the research network wishes to go in. In September 12th and 13th there will be a conference presenting the results of the research network. The papers from the conference are to be published in a Textiles journal, should be consider publishing more widely? Especially considering the number of methods used. We discussed the achievements of the network so far. Feel that with a range of specialities have allowed an engagement with objects and spaces that has not been possible until now. Highlighted that there are different kinds of viewing and the type of space or display affects the interaction with the objects or textiles. Particularly in reference to this was the assessment of the critical eye. We do not just look with our eyes but want to manipulate the objects in the space they are in or change the lighting conditions. In reference to this context is very important to link the space and object when considering them in their historical context and how they were experience in the past. 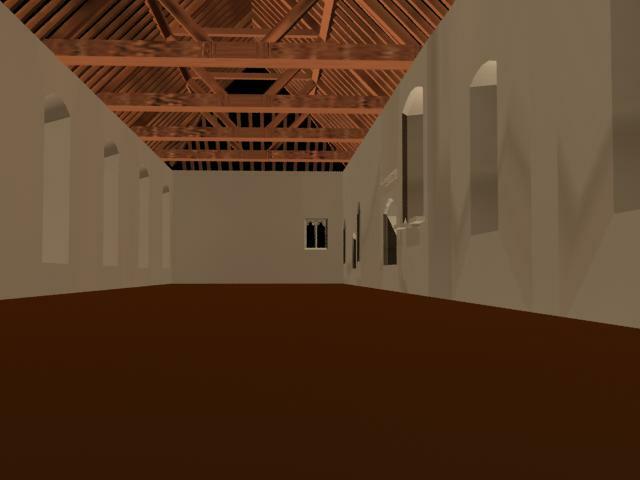 For example the lighting conditions at Owlpen Manor were very different and had a different effect on the viewers to examining objects at the Ashmolean. As such when we are considering the experience of an object we need to respond to how we think about the narrative associated with these objects or spaces. Following the conference it was unanimous that the research network did not want to be downgraded but hoped it would continue in one way or another, maybe setting up a research project. Consider moving forward into looking more at how the computer techniques that have been demonstrated could further the work. There was a bit of a struggle considering whether we could apply them appropriately there is a lot of archaeological theory associated with how visualisation technology can be applied to explore these issues and whether we can examine the experience of those examining/ creating these items when they were created. Whereas the heritage professionals wished to apply the technologies as a technique for reverse designing for museums and engagement impact in schools. Consider more how people are engaging with objects today and allowing greater access to collections. Consider if these techniques can be used to track engagement with real vs. non real objects. With a focus from the Shakespeare Birthplace staff suggesting it would be interesting to examine audience perception of performance props costume etc. I found it really interesting to engage with people who did not have such a background in computing and survey. They were very interested in engaging with new technologies in the same way as I am working in for my thesis but without the background understanding of visualisation and archaeological theory. Whereas I had not thought so much about the cultural heritage applications. It was a really interesting day and I am hoping to become more involved with the network over the coming months. I had a supervision yesterday with my supervisors Prof. Matthew Johnson and Dr. Graeme Earl where we discussed the first renders I had produced of my model so far. 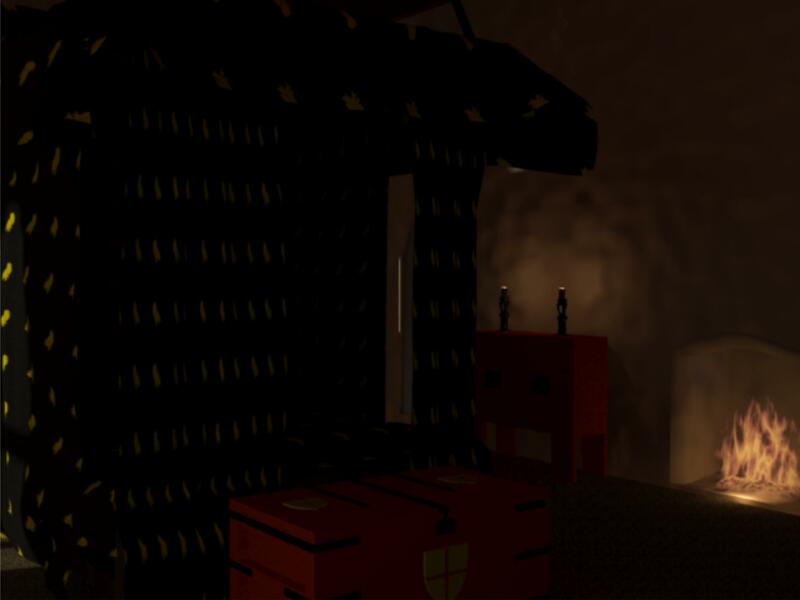 These images just detail the internal space: windows, fireplaces and doorways, and my first attempts at putting a roof and floors on the building. I had been reading a lot around the subject of timber building construction to try to understand the appearance or these types of building. My first port of call was Richard Harris’s Discovering Timber-Framed Buildings this excellent little book explains the construction of these buildings in great detail with lots of helpful, clear diagrams. Based on his writings I started to plan the distances and shapes of my beams and how they would slot together. The following image is the results. I have just added some basic textures and materials to the renders to give an idea about the space that is not bright pink. I also realise that my smoothing groups need playing around with a bit. The space the beams need to cross is quite short (about 5m) so there was no need to think about having to bridge the gap using a tie beam or similar approach. The distance the bays are placed apart does not seem to be set. 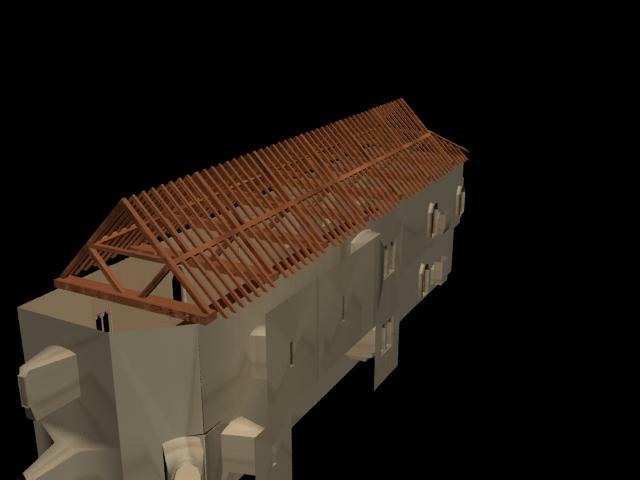 I choose to space them evenly across the entire span about 5m apart as this “looked right” based on photos of other Medieval Roofs I had been using for reference (see below). Before spacing them apart I had to also consider the shape of this part of the frame. 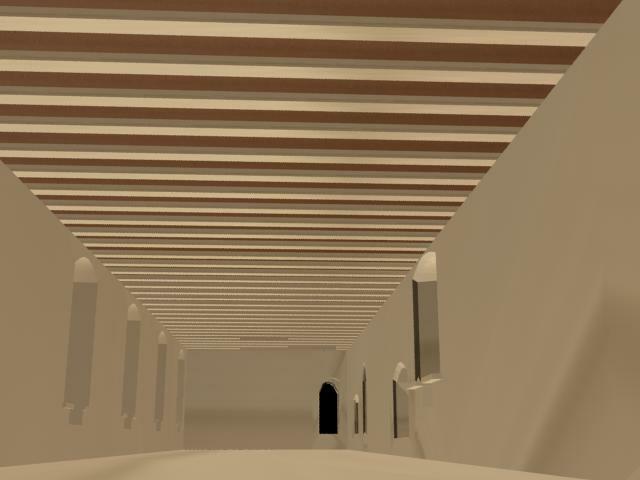 I had been looking at the above images of roof beams and decided to not go with a Crown Post and instead use 2 slanting Queen posts. Presenting these images to Graeme and Matthew highlighted a few errors. Matthew suggested that the angle I had used for the Queen Posts was much too slanted, which is indicative of later buildings. Instead he suggested that it would be much more interesting to include a Crown Post or make the Queen Posts vertical. As there are a number of options instead of just making one decision about how the roof is structured Graeme suggested that instead I create a number of different models with different roofing options, including a crown post and not, moving the number and position of bays around a bit to see if there are any obvious options for lining them up. We also discussed whether there would have been a ceiling concealing these beams. I had always assumed that the rooms would be open to the roof as this is common in halls. I had not really considered putting a ceiling in place on this upper floor. What I had not considered was how much this changed the appearance of the upper apartment. Until now I had been thinking about them as looking fairly similar situated one above the other. However. when the roof is in place it will transform the upper apartment making it feel much larger and more open. Whereas the lower apartment will feel much more contained. 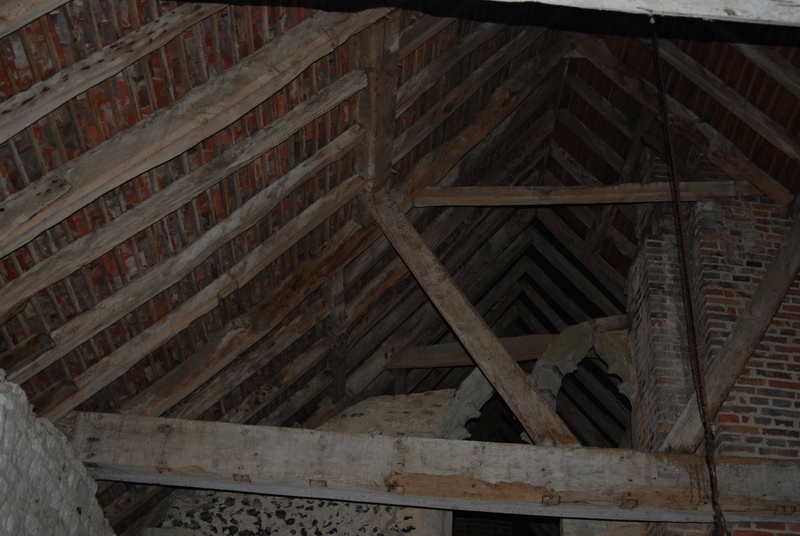 The second discussion point coming from the meeting was in reference to the beams and how decorated they were or not. We had been discussing them in terms of ornamentation of the type found at Ightham Mote (see previous blog). I asked whether, considering the lack of architectural ornamentation found at Bodiam, the beams, which would be cheaper to carve, would also be devoid of decoration. I had been thinking about it a lot as I need to decide whether I am going to shape them sooner rather than later. 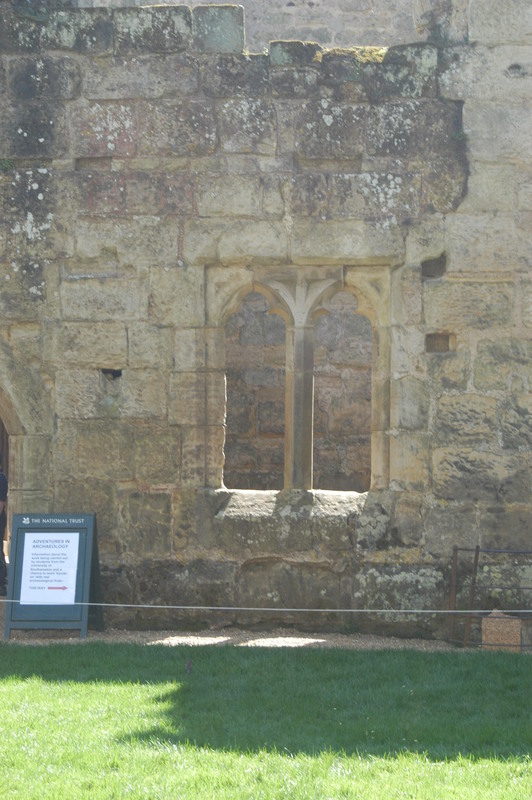 Matthew suggested that the question was even more complex as unlike a lot of slightly earlier buildings the household was not a peripatetic one, it was solely based at Bodiam. Which we would have assumed that more of the building would be decorated as it would not have had to have been moved around. So wondering whether the more decayed areas of the building are as plain as the rest of it is a very hard question, which I have yet to find an answer for. 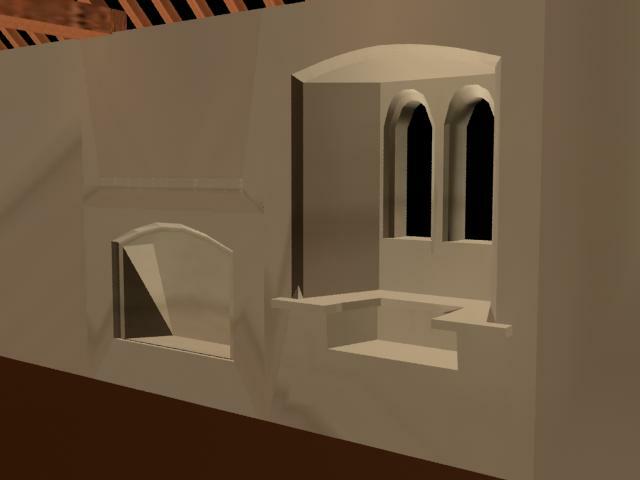 The work on the model continues, I have been working on the complicated courtyard windows. As discussed in a previous post I had been thinking about how I was going to make the windows overlooking the courtyard and as they no longer exist in the area I am focussing on. The windows overlooking the courtyard all appear to have been of a similar “type”, so my first decision has been to model them all on that design as unlike the exterior the courtyard seems to have been fairly uniform. I then had to decide on the number of windows that would be present along this side of the building and their positions. For this I have worked from a combination of observing the standing remains and looking at other reconstructions. 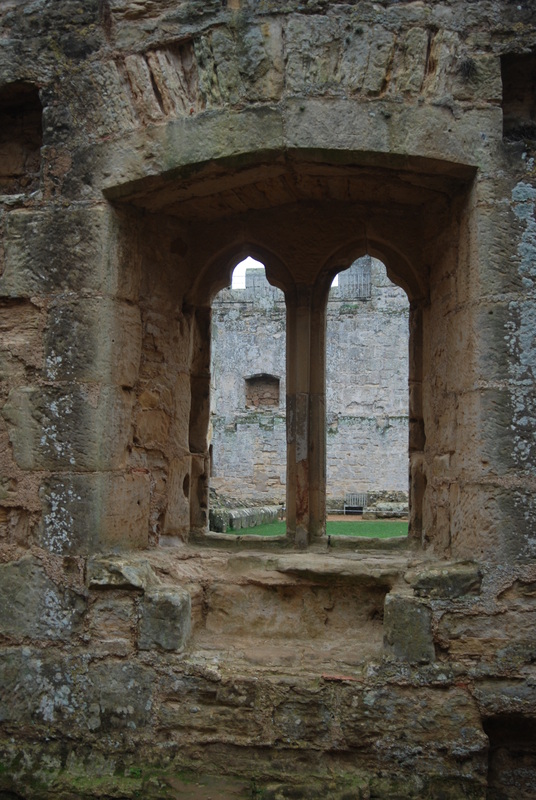 The building itself only offers one clue for these windows right at the northern extreme of the range. Here can be found the bottom of what appears to be a window seat detailed in the photo below. Apart from this much of the standing remains are below the first floor level. Moving onto other peoples representations of the building. The National Trust provide a couple of sources for visitors to look at to try and picture that area of the building. 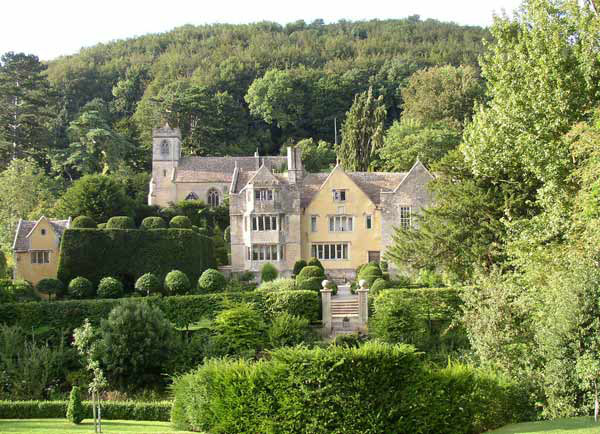 The first is featured in the official guidebook and can also be found in John Goodall’s book The English Castle. It shows a cutaway reconstruction of the entire Eastern Elevation from above in a hand drawn style and in another image the courtyard. 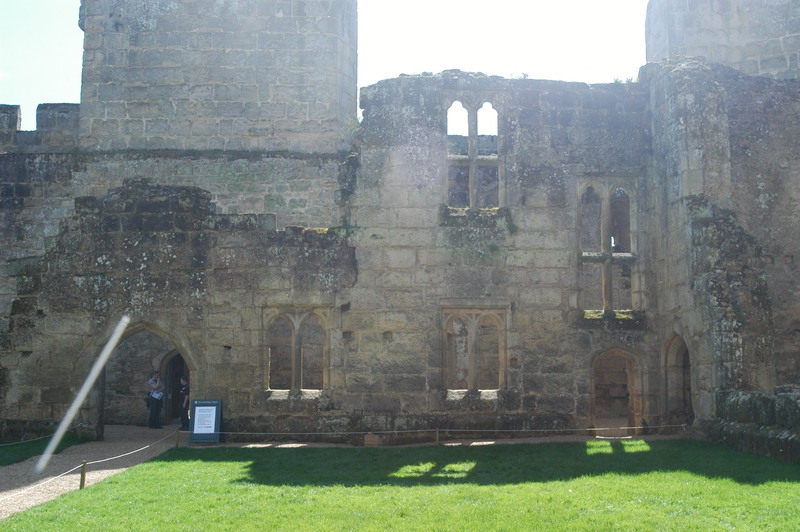 You can see areas of the courtyard walls detailing windows that are no longer present and internal areas of the building. The view is from a height above the building. The windows shown in these representation are of the same type I have suggested and are pictured below. They position the windows for the second floor directly above those for the first floor and there are four sets spread along this length of wall before you reach the spiral staircase. The second is used as an aid for the guided tours for children as an interpretation tool. It is a series of stills used in the film shown at the castle and for sale in the shop. 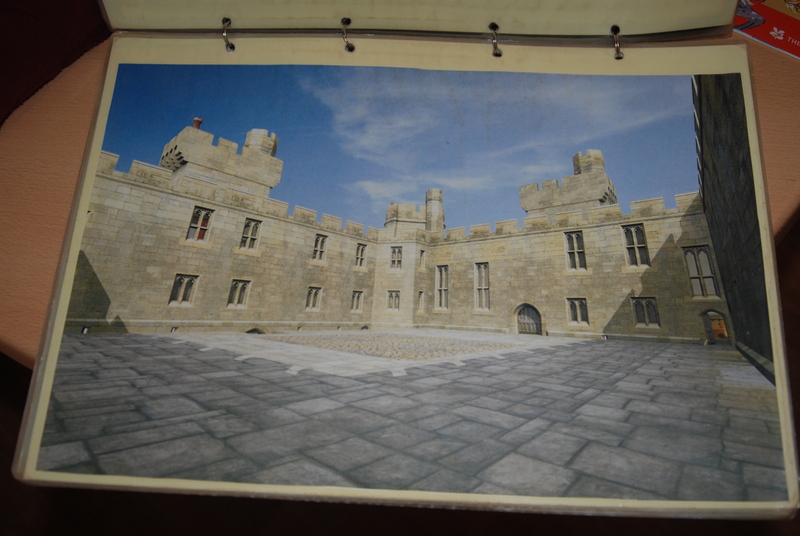 The images are based on a 3d model built of the castle by a digital media company for the National Trust. 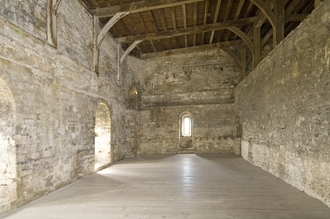 The ones we are concerned with show the courtyard and one of the rooms of the private chambers.The image of the courtyard shows the walls on the eastern edge of the courtyard. 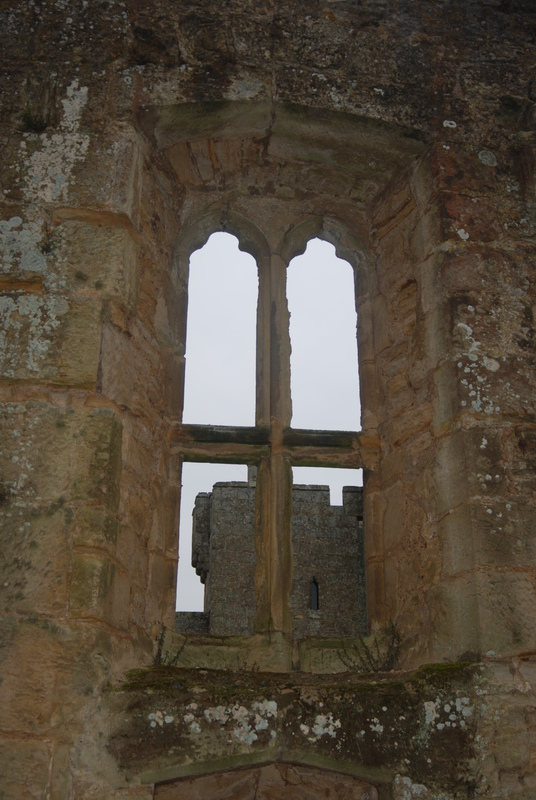 It shows the same type of windows as I have intended to use and the same as feature in John Goodall’s book. Again this image details four sets of windows along this section of the building. 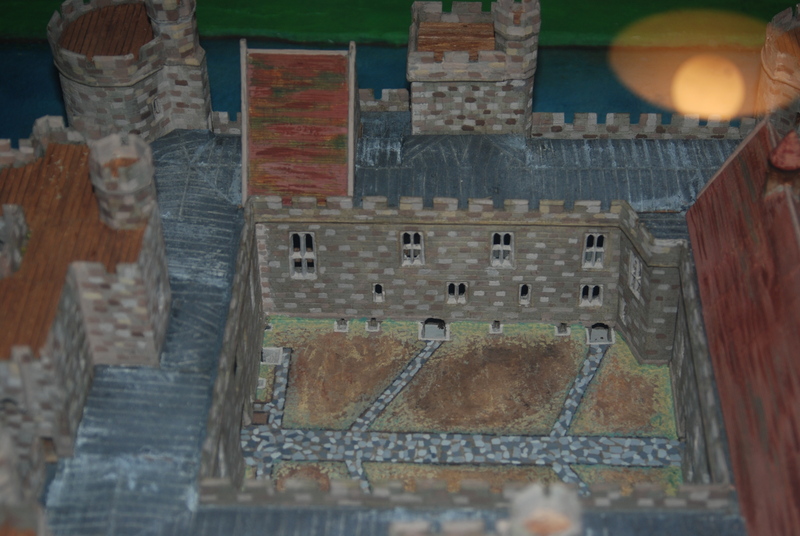 The final source is the model of the castle found in the Northeastern tower in a room above the introductory film about Bodiam Castle. 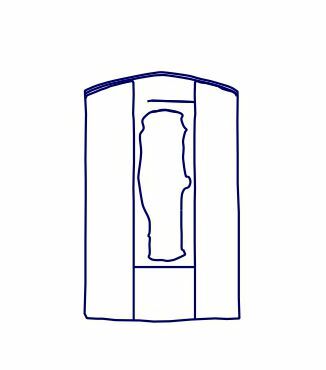 An image of the model can be found below. Instead of lining up the windows on this model they are alterate on the first floor and second floor and on the first floor show alternating single and double windows. I have decided to go for the same approach as John Goodall as I think this fits more in the style of the other areas of the building. I have decided to feature four sets of windows and space them equally out along the range as I feel this reflects the buildings projected symmetry. Moving on from these windows the final piece of wall that I had to produce was the gap between spiral staircase and the southern wall. I firstly inserted a set of doors (one on each floor) at the point where the staircase would have been entered. As a reference I used the same doors that had been used one above the other as used for the entrance to the eastern tower as there is no evidence what type of door would have stood there. I felt that if these doors were found in the same space they would look fairly similar. I made one final decision and this was to place a squint in the wall overlooking the Great Hall. There is no physical evidence for this existing as the wall is entirely gone. I decided it would be appropriate having visited a number of other buildings which have this feature including Ightham Mote and Great Chalfield Manor. 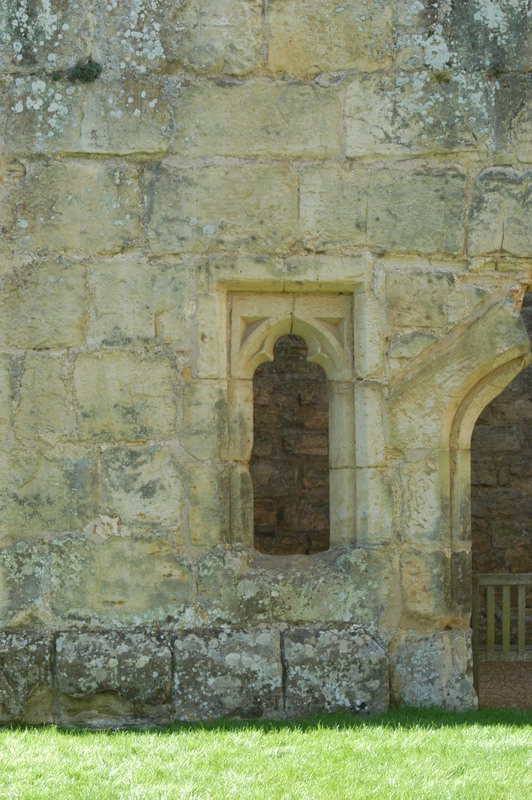 I decided as a similar feature is found overlooking the chapel at the other end of private chambers it would make sense to model it on this window. Over the last week I have been continuing working on the elevation, after an illuminating discussion (baby tutorial!) with Grant Cox I realised I had been thinking about modelling in the wrong way instead of working from the largest size and inputting features into it, I should be thinking about the smallest parts and building out and up from them. As a consequence I have been building each window individually and expanding the walls out from these frames which I have found a much easier method for creating the complex shapes and dealing with the chamfers. Following this amazing discovery I have completed the entirety of the eastern wall and stuck it all together which took a lot less time once I had got the hang of it! I have to begin to think about accuracy and ambiguity. While producing the surveyed area of the building I found that I had to make decisions about parts of the shapes of windows that had been worn or broken away along the edges. I found I was thinking that obviously the edge of the window would have been straight… something that I do not in actuality know. 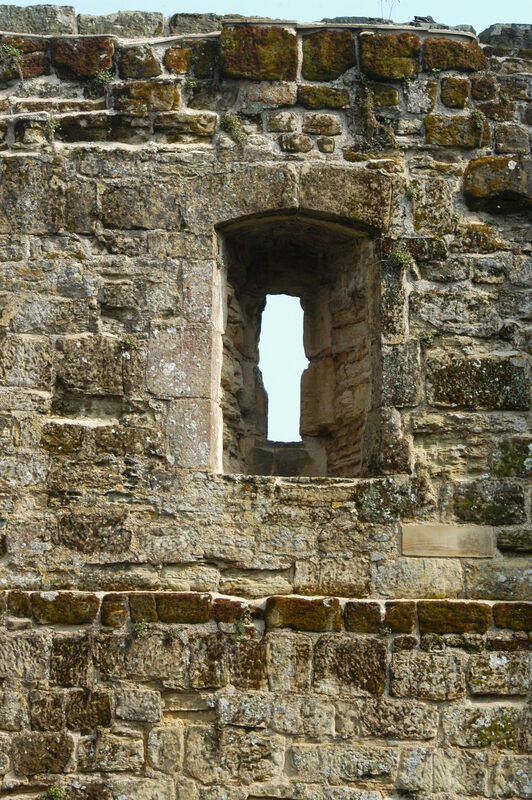 For example this window the edge of the window is much dilapidated I know that at some point on some of the windows of this type bars ran across them and these were probably removed (forcefully) after the castle was abandoned causing much of the damage. But how much of the damage can I rebuild just by looking? To get around this problem I have been comparing the windows to others of the building where evidence for the bars still exists forming a fairly accurate edge and shape for the frame. I need to keep in mind what decisions I am making about rebuilding these shapes and think about how I am doing it. Moving on from these areas which I have survey data for I have to think about my method for rebuilding windows in areas firstly where I know there are standing remains for such features and then secondly for where there are not. Building windows on the northern and southern walls has been and will be reasonably easy using a small amount of conjecture, I have photos of the windows themselves taken from both the interior and the exterior, positioning them will be more challenging, I have been using a combination of images and lining up planes in the 3ds max model to try to position them in line with window positions on the eastern elevation. Much more tricky will be the western wall which is no longer standing. I know positions for windows at basement level (however, this does not indicate position for anything on the upper floor as can be seen from the eastern wall). I also can see evidence for one window seat from the lower level which is a good position to start. I also know that I will have to include the entrance to the spiral staircase on this wall, which links the great hall and both sets of apartments. Currently I have examined other areas of the building with windows overlooking the corridor such as the following, from these I should begin to be able to justify the style of window. In essence I need to begin to be thinking clearly (and carefully recording) every decision I make about the construction of the rooms as their construction particularly from this point on will include an element of ambiguity.